Much of the preserve's geometric metal and granite composite sculpture seeks that higher reality through essential simplicity, balance and whimsical metaphor. For those interested in sculpture parks that are open to the general public, internationally renowned metal sculptor the late Benbow Bullock created www.artnut.com, a site featuring his work. It is also the definitive site on metal sculpture, with links to more than 500 public sculpture parks and gardens around the world. For superb metal scultpure that is available commercially, visit the site of sculpture wizard Marilyn Kuksht. She is able to fill space so magically with so little material www.kuksht.com . See the Sculpture Gallery of this site for other work by sculptor Jim Schnieder. 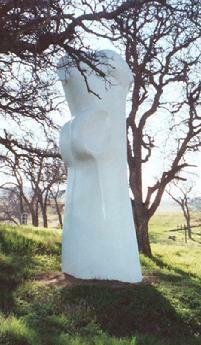 Schnieder's work has been shown at Culinary Institute of America, Rudd Wine Center, Wine Spectator at Greystone Retaurant, Kaiser Center, San Jose Center for the Performing Arts, NASA Ames Research Center (permanent), Dublin Library, Lawrence Hall of Science, Grace Catheral Nob Hill (permanent), Memorex Corporate Lobby, Filoli Nature Trail (bench), Stanford Old Union, Stanford Linear Accelerator Kavli Cosmology and Particle Research Center, Carmel Mission (permanent), Reno Art Museum (bench), Naval Post Graduate School (Permanent), Kenneth Behring Estate, Brentwood Technology Center, San Ramon Library, Bank of America Corporate Technology Center, San Ramon Dougherty Station Community Center, Contra Costa County Dougherty Station Library, Human Society of Nevada (permanent), and various residences.